OSWEGO, NY – Members of the Oswego Players, a local theatrical group which is celebrating its 75th anniversary, have donated proceeds from their recent performances of Death in the OR to a fund that honors an exceptional Oswego Hospital nurse each year. The play was written by local physician Michael Nupuf, MD, and is based upon the book written by John Fountain, MD, who relocated from the area several years ago. Each year, the nurses at Oswego Hospital select an outstanding peer for the annual award, which is named in memory of Jean Carpenter, an LPN, who passed away several years ago. 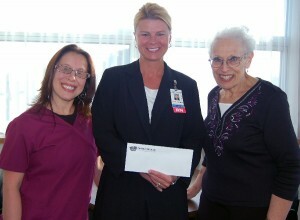 In the photo from left are Tammy Wilkinson, the play’s producer and an actor in the show; Valerie Favata, Oswego Hospital’s Chief Nursing Officer and Inez Parker, who directed the play.